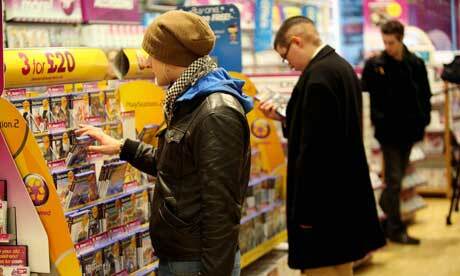 Playtime … games customers defy the recession. Everyone’s talking about recession – except gamers. A trawl of the game retailers in Brighton recently revealed plenty of customers, long queues waiting to pay and sales assistants saying that business is great, thank you very much. A manager at a branch of Game said trade is as good, if not better than last Christmas, though people are being more discerning: they are only interested in the best games. Assistants in both Gamestation and Gamestar confirmed that the only hint of the recession is customers’ desire to get value for money. The only complaint wasn’t about demand, but supply: they simply haven’t got enough copies of some titles. It’s not just in Brighton. Despite the recession, the computer games industry is exhibiting particularly strong sales. UK console software sales for the third quarter were up 15% year-on-year, with a total of 13.2m units sold. Projections by GfK Chart-Track, a research company, suggest that the harsher climate will not have a significant impact. “The UK market in particular is gearing up for a best-ever fourth quarter overall. At the end of the year, 2008 should be 30% up on sales over 2007 with 75.5m units of console software sold,” says Dorian Bloch of GfK Chart-Track. And the the games industry has actively widened its consumer base.Nintendo says it is seeing an almost a 50/50 breakdown between male and female players across all its platforms – gaming has traditionally been very male – and an increasing number of players aged 50 or over. Another fortuitous aspect is the timing of the recession. The videogames industry is cyclical, fuelled the release of each new generation of console. At the beginning and end of each console’s lifecycle, the industry is under pressure: profits are tighter as resources are redirected from the old generation to the new. The good times are in the middle when an optimum number of hardware units have been sold and publishers consequently sell the highest volume of software. Luckily for the games industry, consoles are in those healthy middle years. Nintendo alone is 76% up on Wii hardware sales across Europe year-on-year, with more than 3.5m units sold in the UK since release. However, that trend won’t continue if people become less willing to buy expensive consoles in a recession, although so far that doesn’t seem to be the case. Figures from the Entertainment Retailers Association show that up until mid-November, hardware sales for 2008 were up 14.1% on the same period last year. Certainly, Christmas is having a positive impact on sales, especially as games are perceived as good-value gifts. Another analyst, Nick Gibson of Games Investor Consulting, agrees: “As the market has become more casual-gamer focused, then it will be more susceptible to the economic rhythm.” However, he points to a potential casualty other than the PS3: “I would say that Nintendo therefore would be the most susceptible.” Anecdotal evidence suggests he could be right. Conversations with independent retailers around the UK suggest the interest for Nintendo titles is not what it was; they are already seeing more secondhand games brought in and fewer sold. What could really hurt the industry is the credit crunch. With new titles costing anything up to £20m before they sell a single copy, a long-term credit squeeze could make it hard for both developers and publishers to raise sufficient revenue to develop games. For Stuart Dinsey, publisher of the industry games trade magazine MCV, this is the cause for most concern. A desire for safe investment bets could see less innovation, but as the shop assistants in Brighton already know, customers are looking for quality. In the future this could mean less diversity but better games.